It’s a sunny summer afternoon and the activity along Vancouver’s northeast False Creek has never been more vibrant. Paddle boarders and dragon boats share the water as people flock to the new beach located just north of The Telus World of Science. Kids splash in the water as surfers catch six-foot waves off in the distance. Yes, you read that correctly, surfing in downtown Vancouver. This is the vision of REVIVER Sport+Entertainment, a sport experience design firm looking to reconnect locals and visitors with the city ocean water by creating a multi-purpose surf park and urban beach. 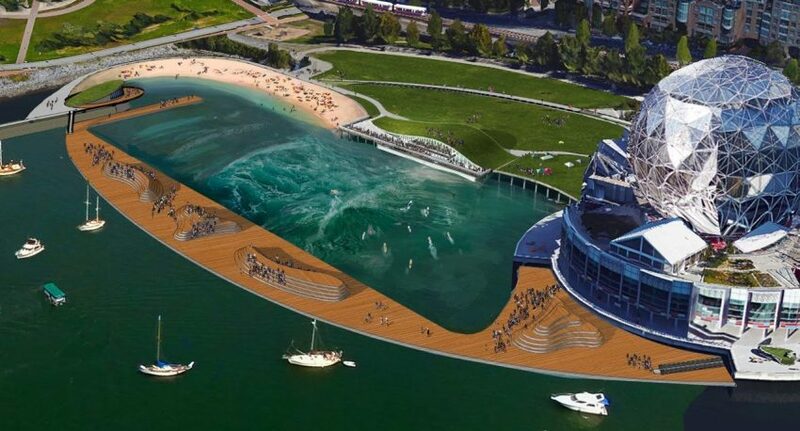 Their proposal, known as CitySurf (www.citysurfpark.com), provides Vancouverites with social amenities and programmed park space, all while actively addressing the significant pollution problem in False Creek through an innovative water filtration system within a floating wavepool. “Much of our city waterfront invites participation on the water but for reasons including physical conditions, water temperature and pollution, it offers only limited immersive opportunities”, states architect and REVIVER CEO Philip Davis. ”Vancouver is an ocean city with an active outdoor water-oriented lifestyle, but due to geography it lacks open ocean surf. CitySurf changes all that. We’re proposing to create a world-class city amenity, in an underutilized waterway, while tackling a recognized environmental issue in a city that promotes itself as one of the greenest on the planet”. 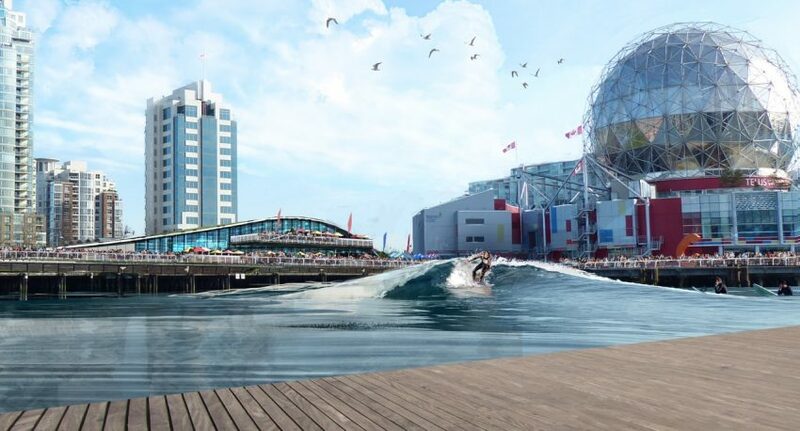 CitySurf Vancouver would be a Canadian first for urban surfing and the second surf park in North America. The proponents believe Vancouver is a perfect city for such a facility with east False Creek being the ideal location. The facility would be located adjoining Science World and Creekside Park, and include a pay-for-use surf park, a publicly accessible beach, along with restaurant and entertainment facilities topped with a green roof. The designers propose to integrate hospitality and entertainment activities as a prime contributor to the financial viability of the project. “We want to create a community facility that responds to the needs of multiple stakeholders, but achieving this requires capital, so revenue streams need to be part of that equation” notes REVIVER partner and Experience Designer, Colin Weston. “We saw an opportunity with CitySurf to program public open space uses with social activities to deliver a city asset that otherwise would never happen if it was reliant on public funding for design, construction and operation”. “The technological and environmental aspects of the project are key”, adds Davis. “The technology has advanced to the point now where man-made waves are becoming, literally, the wave of the future. 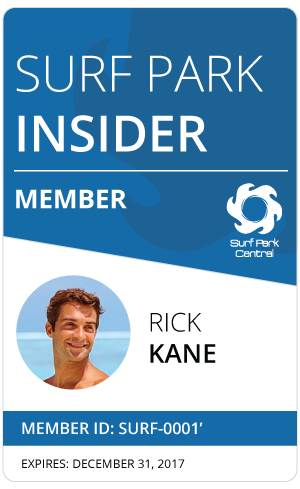 We are able to control the wave height and regularity to create an enjoyable surfing experience from novices and kid’s camps all the way up to elite level surfers. Recent openings of surf parks in the UK and US, along with proposals in Australia and Europe are proving the commercial viability and operation of artificial wave surfing. These surf parks are now attracting professional surfing competitions thanks to the consistency and quality of the wave shape. A number of shoreline locations around the downtown peninsula were considered, but the REVIVER team determined False Creek as the ideal site given its access to the seawall, public transit and a densely urbanized population. 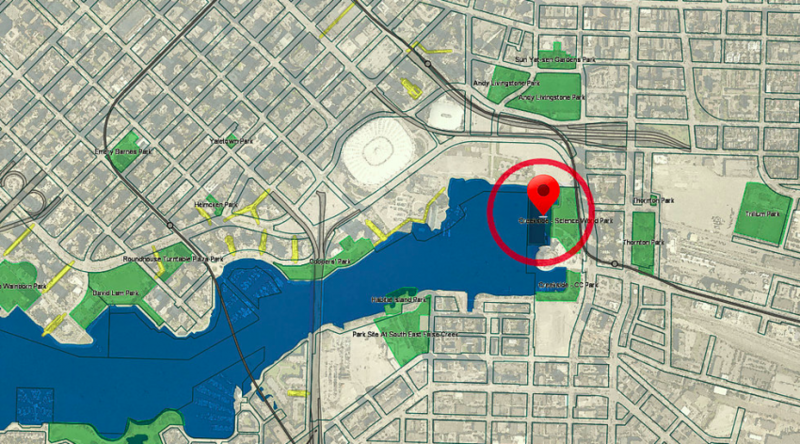 The False Creek location and facility design also creates a new swimming area in waters that are currently unsafe for swimming, according to data from Vancouver Coastal Health’s regular water quality reports. The wavepool is enclosed by a floating perimeter structure, which filters water directly from False Creek through a porous membrane and then geo-thermally warms it before recirculating the filtered water in a continuous cycle. The membrane system would actively generate an improvement in False Creek water quality, highlighting the City of Vancouver mandate to show leadership in environmental stewardship and responsibility. The project has received early endorsement and support from WaveParks Canada, The Canadian Surfing Association and Surfing Canada, who all see the potential for CitySurf to expand surf culture while becoming a regional economic generator. With the recent announcement by the IOC to include surfing in the Tokyo 2020 Olympics, the Canadian Olympic Committee recognizes the long-term benefit of the facility “as a future Canadian athlete training resource that aligns with the Own The Podium program and the Olympic endeavour”. Given City tenure of the site, REVIVER have engaged with the Vancouver Park Board to discuss the concept and alignment with their VanSplash Aquatics Strategy. To generate interest, feedback and consensus, REVIVER will also engage stakeholders such as the City Of Vancouver, Telus World Of Science, adjoining property owners, community associations, dragon boaters and other False Creek users – while taking CitySurf public as a means to engage in the ongoing collective conversation about re-imagining Vancouver’s waterfront. As Davis notes, “No doubt the idea will excite and inspire people – and possibly surprise and confront others. But that’s the nature of proposing a creative and dynamic city-shaping concept. As designers and entrepreneurs, we’re passionate about enhancing the livability and enjoyment of our city. We’re going public with CitySurf early in the process to spark interest, feedback and participation from our local and global communities. When challenging people to engage in an innovative idea, sometimes you have to make waves for great things happen! Quite literally, it appears.